If you look around the Internet you will find Web sites that aim to 'tell the truth' about particular businesses and products. So you will find sites exposing Scientology, Amway and ... Bose! What is it about Bose that gets up the nose of some audiophiles? Can you get better sound for fewer dollars than Bose provides? For sure. Does Bose inflate its quality somewhat in its promotional literature? Absolutely, but then do almost all other companies. So let's keep things in perspective. Bose's subwoofer/satellite systems aren't the best value for money, nor the world's most accurate speaker system, but they fill a need that many people find more important: good sound quality from inconspicuous speakers. I should add that Bose is, in engineering terms, a thoughtful company. There are little things that many more highly reputed companies either don't think about, or seem to consider to be someone else's problem. Specifically, Bose's Acoustimass speaker systems manage the satellite/subwoofer crossover themselves. Many other sub/sat systems rely on the receiver's crossover. The problem there is that more than half home theatre receivers use a fixed 80 hertz crossover, which is far too low for small satellites. Okay, even Bose isn't perfect in this crossover region (my measurements on the Acoustimass 16 Series II show the 110-220 hertz region down around 6dB from the overall level), but it at least attempts to deal with this. 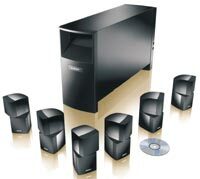 The remarkably good value JBL Simply Cinema SCS 20, for example, suffers a 9dB drop from 75 to 220 hertz when connected to a regular receiver. And similar designs suffer similar problems. Way back in 1978 the American audiophile record label Telarc made a recording that can be truly regarded as legendary. Using then-new digital recording technology (although in the absence of a digital consumer format, the original release was on LP), Telarc captured Tchaikovsky's 1812 Overture, and for perhaps the first time the cannons were properly recorded. WARNING! The cannons of the Telarc Digital "1812" are recorded at a very high level. Lower levels are recommended for initial playback until a safe level can be determined for your equipment. I have no reason to disbelieve Telarc. So given the limited technology available in 1978, it's likely that the whole balancing thing was done by ear. That there was clipping, though, cannot be in doubt. The screen shot above shows the first two-tenths of a second of the right channel of the first cannon blast (digitally ripped from the CD, so there are no equipment limitations imposed on the result). It was only for reasons of keeping the graphic legible that I cut off the other four clipped peaks from this blast. The left channel is virtually identical. Nearly all the 16 cannon blasts show some clipped peaks. Canon, Sharp, Sony and JVC announced today that they've agreed on a high definition consumer digital video camera format. Likely to be called 'HDV', this will provide for recording 720p or 1080i on standard DV format cassettes. Both 50 and 60 hertz varieties will be supported, so these ought to be compatible with HD TV systems around the world. The video will be encoded using MPEG2 (ie. similar to DVD, but at bit rates of 19 and 25Mbps respectively) and the audio will be two channel Dolby Digital at 384kb/s. This last is interesting. The normal bit rate for two channel DD is 192kb/s. So why the high rate? Perhaps to allocate space to support DD5.1 (which is normally on DVD at 384 or 448kb/s) in the future. Of Canberra, that is. Sure, it's not the only one that has yet to provide Standard Definition Digital TV from its Tuggeranong retransmission tower (Prime and SBS are equally guilty), but as of last night SCCap had a promise for a startup in June 2003 on the Digital Broadcasting Australia Web site. This is particularly irritating because SCCap has never got around to upgrading its analogue Canberra broadcasts to stereo sound. UPDATE (Friday, 4 July 2003, 11:07 am): - I whinged about this to DBA and now, I see, they have updated their site so that it shows Southern Cross Capital providing to us Valley residents digiTV some time between July and September 2003. Likewise for Prime. Now, I suppose, just a few more years to go before High Definition comes to Canberra as well.